This gene encodes a member of the estrogen receptor-related receptor (ESRR) family, which belongs to the nuclear hormone receptor superfamily. All members of the ESRR family share an almost identical DNA binding domain, which is composed of two C4-type zinc finger motifs. The ESRR members are orphan nuclear receptors; they bind to the estrogen response element and steroidogenic factor 1 response element, and activate genes controlled by both response elements in the absence of any ligands. 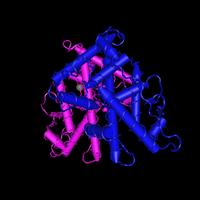 The ESRR family is closely related to the estrogen receptor (ER) family. They share target genes, co-regulators and promoters, and by targeting the same set of genes, the ESRRs seem to interfere with the ER-mediated estrogen response in various ways. It has been reported that the family member encoded by this gene functions as a transcriptional activator of DNA cytosine-5-methyltransferases 1 (Dnmt1) expression by direct binding to its response elements in the DNMT1 promoters, modulates cell proliferation and estrogen signaling in breast cancer, and negatively regulates bone morphogenetic protein 2-induced osteoblast differentiation and bone formation. Multiple alternatively spliced transcript variants have been identified, which mainly differ at the 5' end and some of which encode protein isoforms differing in the N-terminal region. There are 35 articles specifically referring to this gene in PubMed. Functionally, the gene has been tested for association to diseases (Adenocarcinoma; Deafness; Endometrial Neoplasms; retinitis pigmentosa; Syndrome) and proposed to participate in a process(positive regulation of transcription, DNA-dependent). Proteins are expected to have molecular functions (AF-2 domain binding, metal ion binding, sequence-specific DNA binding, steroid hormone receptor activity and 3 others) and to localize in nucleus. Putative protein interactors have been described (ARHGEF15, CALM1, DAXX, DUT, ESRRA, ESRRG, HGSANDMRPL12ANDSLC25A10, NCOA1, NR0B2, NRIP1, PNRC1, PNRC2, PPARGC1A, PPARGC1B, PROX1). ERRɣ Reporter Cells are prepared using INDIGO’s proprietary CryoMite™ process. This cryo-preservation method yields high cell viability post-thaw, and provides the convenience of immediately dispensing healthy, division-competent reporter cells into assay plates. There is no need for intermediate spin-and-wash steps, viability determinations, or cell titer adjustments. The principle application of this assay product is in the screening of test samples to quantify functional activities, either agonist or antagonist, that they may exert against the estrogen related receptor. This kit product is an all-inclusive assay system that includes, in addition to ERRɣ Reporter Cells, two optimized media for use during cell culture and (optionally) in diluting the test samples, a reference agonist, Luciferase Detection Reagent, a cell culture-ready assay plate, and a detailed protocol. The gene contains 46 distinct gt-ag introns. Transcription produces 27 different mRNAs, 26 alternatively spliced variants and 1 unspliced form. There are 9 probable alternative promotors, 5 non overlapping alternative last exons and 6 validated alternative polyadenylation sites (see the diagram). 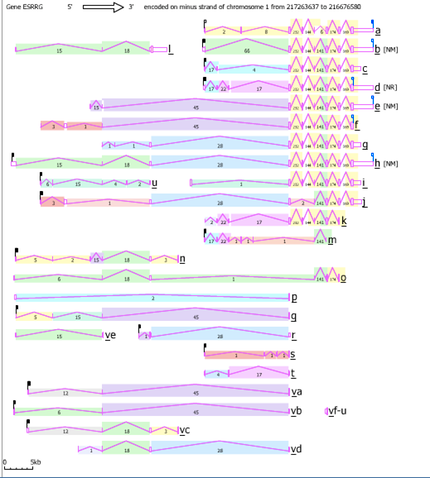 The mRNAs appear to differ by truncation of the 5' end, truncation of the 3' end, presence or absence of 22 cassette exons, overlapping exons with different boundaries. Efficacy of translation may be reduced by the presence of a shorter translated product (uORF) initiating at an AUG upstream of the main open reading frame (in variant aAug10, bAug10, cAug10, dAug10, iAug10, jAug10).